Thanks to Mary for sharing the above photo of County Road 77 in Holmes County, Ohio. 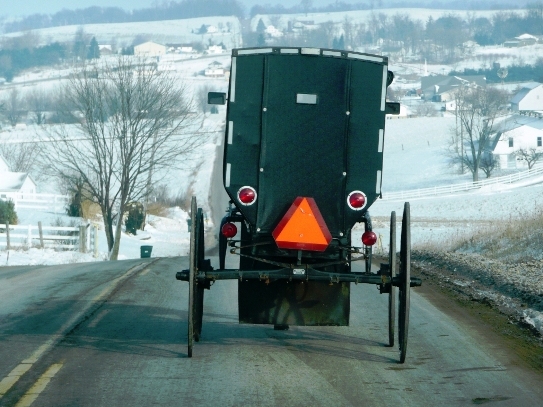 You might recall CR-77 mentioned in the comments section of the Amish buggy safety post of a couple weeks ago. Hurst and McConnell remind us that CR-77 is known locally as the “Amish roller coaster”, for its series of rolling hills. You can kind of get a sense of that here from this photo. CR-77 runs from Highway 39 near Berlin through Bunker Hill and on up to Mount Hope. Heading north along CR-77, you pass a number of interesting landmarks. The large building of the Amish and Mennonite Heritage Center, home to the Behalt cyclorama, lies on the right. Heini’s Cheese Chalet, with its distinctive Swiss-inspired design, is hard to miss near the Bunker Hill crossroads. Kauffman’s Bakery lies across the street. I recommend their pies. Heading onwards, you come to the Amish-owned Time and Optics business, selling clocks and a wide variety of other items including binoculars and scopes. 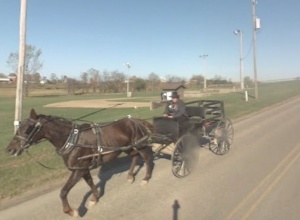 Quite a few Amish businesses are found along CR-77, for that matter, including a buggy shop and a shoe store. While they’re not too visible from the road, a few Amish cemeteries lie on farms adjacent to CR-77. Memory Park features a baseball diamond where Amish youth play in the summer. CR-77 finally ends at the little post office in Mount Hope. The village is well-known for the Mount Hope Auction (hosting the Haiti auction and many other events), Mrs. Yoder’s kitchen (popular among Amish and non-Amish alike), and garage door manufacturer Wayne-Dalton (where many Amish work). CR-77 is used heavily by Amish. You typically pass many bicycles, buggies, and other horse-drawn vehicles along its five miles. But as mentioned before, CR-77 is not the safest road in the county, because of its relatively high speed limit and low visibility due to the hills. Speed limits have recently been dropped on the road, though. Marcus Yoder, it strikes me that you know quite a bit about your family’s heritage, and I think that is wonderful. I wish I knew more about my family’s heritage. Do Mennonite Heritage Centres have archives and different resources you and families can use to research their pasts? I was excited to read the title of your article as we go to Holmes County every year for a vacation and I love riding down Hwy 77. It is a beautiful ride and we’ve been to most of the places you mentioned in the article. I’ve often wondered why the speed limit isn’t slower on the roads in Holmes County as there are so many hills and curves. Our friends’ daughter was killed about 4 years ago when the pony cart she and her sister were riding in was hit from behind by a man driving too fast. The earlier question about football is one we get often around here. It is true, it is generally considered too violent by the Amish, although I know many who love to watch and you will sometimes see the younger fellows hanging around the field fence on Friday nights watching. As someone mentioned earlier, Hiland in Berlin does not have a football team – but they do have a very aggressive soccer team! AS well as other sports. Hiland very much has a reputation in the area as being extremely serious and aggressive in all of their sports, and it is often an issue with other schools about how they run their team’s programs. There have even been complaints to the state’s athletic commission. The Mennonite influence of always doing your best to achieve/perfectionism is very strong there; I often hear comments from more conservative Mennonite friends that they are not showing “humility” in play. Not that I agree. But it is very interesting to listen to as a non-Mennonite resident of the area.